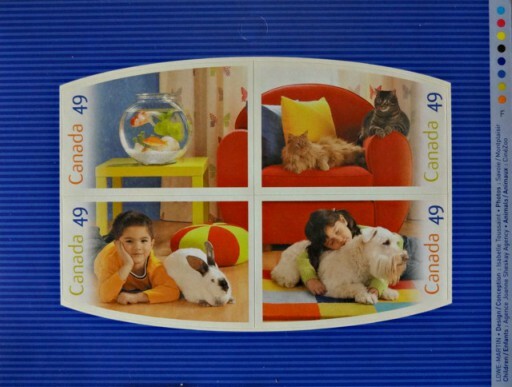 Individually, each stamp shows an animal at home, two of them cuddling up with the children. But put the stamps together in a pane of four and they become panes of glass, forming a window through which we view the complete scene, all the children and pets in one room. Designer Isabelle Toussaint prepared a set that served as a common background for each of the four stamp scenes, and photographer Marc Montplaisir shot each scene separately. The four best photographs were then pieced together to make a seamless composite image. ...those sure are interesting stamps. and to think I saw these for the first time last week, from my local stamp dealer! The photographer's insights are fascinating. most of these descriptions of the stamps are usually rather dull and dry, but, I think this photographer would have been fun to work with! The combination of the four as a window is a superb way of seeing them. If I'm going to use these, I will need to find a large stamp (or envelope) to keep them together! I'm not really into pet stamps, but I must say that these seem a clever and colourful design that I like. Trust the cats to find the comfy chair. Clever how he cropped the images into a perfect whole.